Location: Figueira da Foz. Portugal. Coauthors: Juan Enrique Álvarez. Manuel Cifuentes. Alfonso Peralta. Mariana Kmaid Levy. All these elements make up the crucible of images of a beach. In this case of the beach of Figueira da Foz / Buarcos. We are aware of the wide variety of activities that can be developed on a beach, however, current needs have changed, and this leads us to rethink the appropriate model to service this beach throughout the year, and not only in the summer. According to municipal regulations, and taking into account the resulting parameters, excessive fragmentation, almost atomization of uses, seems incompatible with a phased development. The approach of three different zones does not seem an adequate solution for the beach to work properly. So, we reinterpret the program. Let's make it more balanced and provide the beach with all the services, in all its extension equally. In this way, it will always be an active beach, at any time of the year, at any time of the day. Through an effective and adequate grouping of the uses, we get that tension that activates each zone of the beach in which the new elements that serve the same are inserted. The grouping system allows for controlled growth, so that it adapts to the general idea of proposing a proposal in phases. 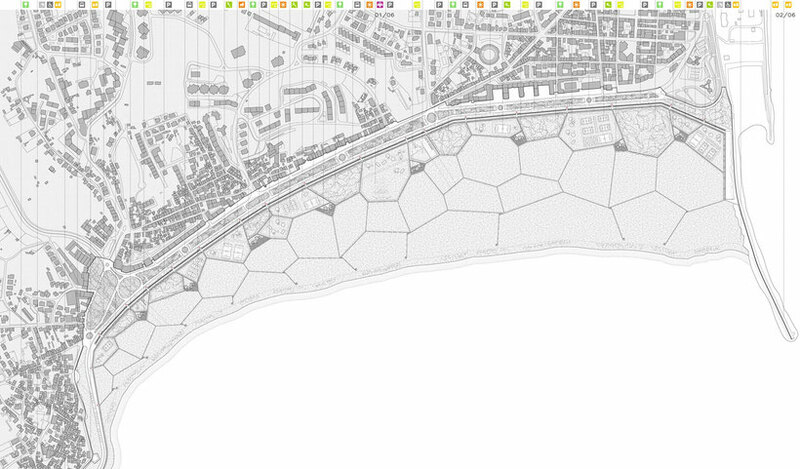 The network of roads proposed, connects these pieces longitudinally with each other, and transverse between the city and the edge of the sea. The paths arise from the groupings of these elements, since their geometry is the generator of the plot described on the beach. They are nuclei that radiate towards the outside a network of interconnected roads, which provide multiple routes to the beach. Starting with four pieces of pentagonal geometry, and through their combination and position in plan, we propose eight service cores that are located along the beach. Four pieces, one of 75m2, another of 45m2 and two of 30m2, are combined together generating the service cores. 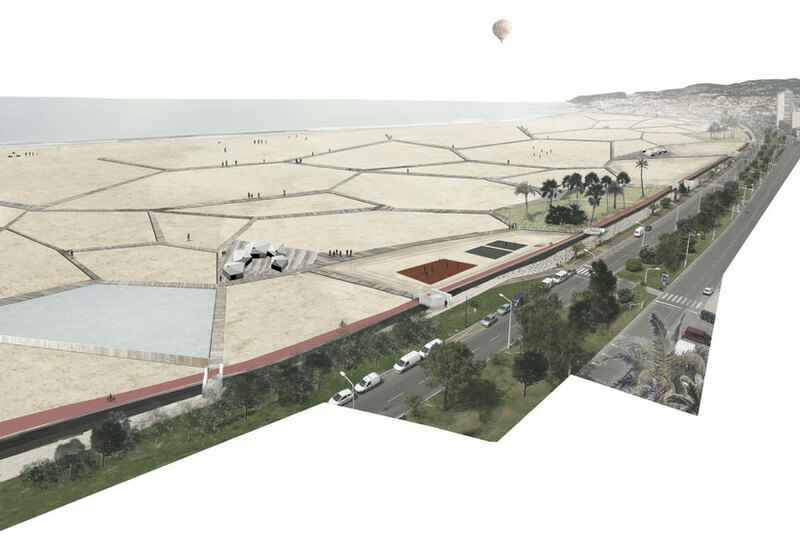 In this way, we managed to group the excessive fragmentation of elements, and we created some activity centers with a sufficient entity and on a scale of Figuiera da Foz beach. The internal organization of each of the pieces that make up the groups, is divided into public spaces and private spaces. Around a commercial space or changing rooms, warehouses, toilets or aid stations are always placed. The character of the spaces is different. 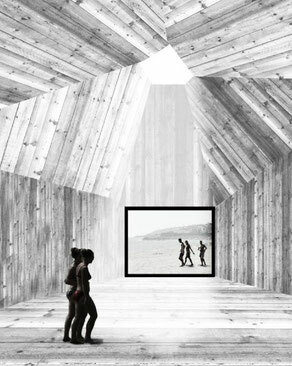 While the private spaces are conceived as mere 2,20m high warehouses without natural light, the public spaces open onto the beach through a large window framing the horizon. They also receive overhead light thanks to a skylight located on the roof that serves only these public spaces. The external volume, compact and horizontal, is opposed to the vertical space generated in public areas. On the beach, the fewer elements, the better. And of course, fixed none. The beach should be an element on which to lean, almost without touching the sand. Based on this premise, the proposed construction is light, quick and reversible. In other words, if the withdrawal of one of the elements is considered in the future, the footprint on the beach will be minimal. It also allows great ease in the management of each of the phases in which construction can be undertaken each group. If the beach is conceived as a continuous element that is provided with services as demand demands, each of the scales of action must respond to this requirement. From the urban point of view, as is the case with the new layout of the promenade and its public parking, even the gesture, natural, of tracing some routes in the sand. The light elements are formed in three phases. In the first, a minimum network of services is proposed, capable of providing the beach with the necessary elements to start operating. In the second and third phase of the project, the maximum level of endowments for the beach is reached. A contained growth, which allows, in economic terms, to adjust to the current needs of society. The construction is carried out by means of a prefabricated industrialized system of structural contra-laminated wood panels, supported by metal profiles on a minimum and punctual foundation of reinforced concrete. The parameters of sustainability of the wood are unattainable by other construction materials such as concrete or steel. The facilities of these elements are based, not so much on the term currently used for sustainability, but on common sense. In this way, the air conditioning is solved by means of a system of individualized low consumption for each element, always supported by the cross ventilation through the window and the skylight. In addition, to avoid excessive solar radiation, there are some pergolas around the pieces and a motorized louver system that protects the skylight. All the facilities are connected to the existing general network. We want to emphasize the need to forget about terms such as sustainability and all its derivatives, in order to demand a more sensible construction. That wisdom is what will result in elements that respect the environment in which they are inserted, without the need to belong to any other category than that of Architecture.